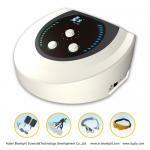 Electro acupuncture is the application of electrical current to acupoints on a patient. This can be done with either electrodes or alligator clips clamped to needles. Once the electrodes or needles are in place, a box which controls the current is turned on and the electro acupuncture can begin. The patient is then left alone and the electrical current continues for another 20 to 30 minutes. Our Bluelight is the similar with this, but a little different. We use pads to replace the needles. Many patients are afraid of the needles. 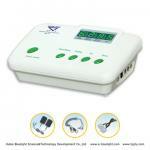 So our Bluelight electro acupuncture device can release the worry of patient to get better treatment. 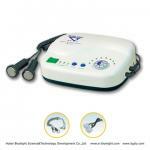 This process creates a pulsating sensation that is not painful to the patient. The practitioner uses blankets and pillows to ensure patient is comfortable and in fact many times he or she will fall asleep. Many patients say that after the acupuncture they feel relaxed and rejuvenated. Some acupuncturist jokingly refer to this state as "Aculand". Acupuncture, an ancient form of internal Chinese medicine, was for many years dismissed by western medicine as an unsubstantiated science. As more and more people began to see positive results from their visits to their practitioners though, acupuncture eventually became a household word. However, the words "electro acupuncture" aren't quite as familiar. You would never guess that this form of Eastern Medicine has actually been in existence since the 1930s. The theory of Chinese medicine is that there is an energy flow which moves through the body, somewhat like a river. This current travels through the limbs and internal organs of a body. The channels that connect each area of the body are called Meridians. The flow is called the Qi (pronounced chee). When someone becomes ill, it is because the Qi has a blockage or imbalance. Electro acupuncture helps to restore the flow, almost like removing the dam from a river. Electro acupuncture can be especially helpful with neurological diseases, including paralysis, pain, numbness, and muscle spasms. It can also treat internal as well as external trauma and therefore works well on chronic and acute conditions. 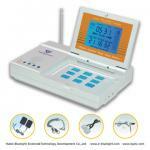 Generally electro acupuncture works well when mixed with traditional acupuncture. Patients will sometimes see positive results after one session, but usually six to eight sessions are suggested.